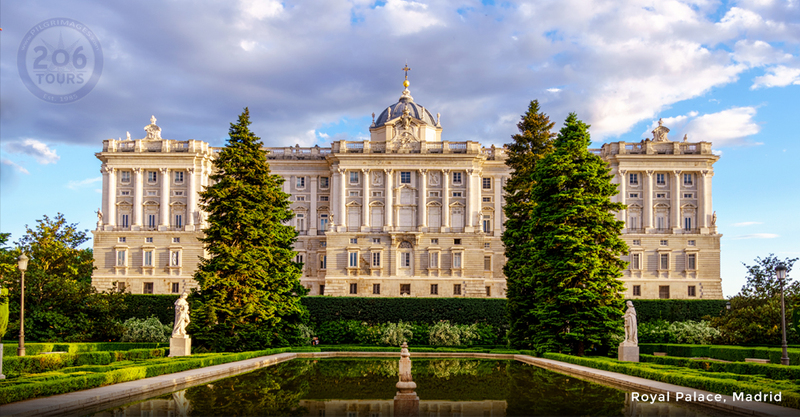 Upon arrival in Madrid, you will collect your luggage in the baggage claim area, and continue to the Arrival’s Hall where you will be greeted by your tour guide and/or driver. Transfer and check-in in the hotel. Late afternoon we will be able to attend Mass at the first foundation of Santa Teresa, The Convent of Saint Joseph. After Mass, there will be free time at leisure. Dinner and overnight in Avila. After breakfast we will depart for a visit the town of Segovia. Segovia is the town where Saint John of the Cross is buried. 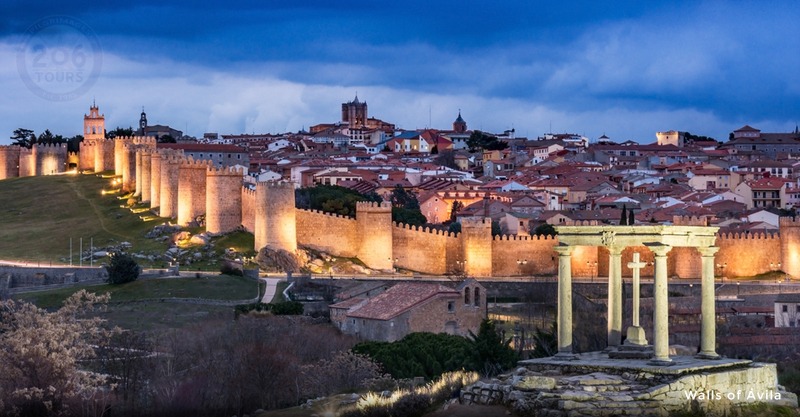 Segovia is a relatively small city, strategically sited on a rock ridge, it is deeply and haughtily Castilian, with a panoply of squares and mansions from its days of Golden age grandeur, when it was a royal resort and a base for the Cortes (parliament). It was in Segovia where the Isabel La Católica was proclaimed queen of Castilla. We will find a huge number of impressive monuments and buildings inside its medieval walls: the Roman aqueduct: Segovia Acueducto. It was built at the end of the first century during the reigns of the Emperors Nerva and Trajan. Over 800m long; supported by 166 arches and 120 pillars, stands up without a drop of mortar or cement; the cathedral, the last major Gothic building in Spain; the Alcázar, an extraordinary fantasy of castle, with its narrow towers and flurry of turrets; the Vera Cruz church, built by the Templar Knights; the synagogue, very similar in style to Santa María la Blanca in Toledo; and many Romanesque churches as San Millán, San Justo, San Martín, etc. Continue on to Avila for dinner and overnight in Avila. After breakfast we will visit the city of Avila. Here the atmosphere has changed very little since the days of St. Theresa, to whom the city is dedicated. St. Theresa the great mystic, was the first woman to be named a Doctor of the Church. We will visit: the crypt of La Santa Convent, built on the site of the house where she was born; La Encarnacion Convent, where St. Theresa became a nun and home to the most comprehensive museum dedicated to her life; the Cathedral and the Cuatro Postes (four columns) which commemorates St. Teresa, at the age of seven convinced his brother to run away with her to die as martyrs in the land of the Moors. The uncle caught them at this site, Cuatro Postes, and returned them home. Dinner and overnight in Avila. Breakfast in the hotel. 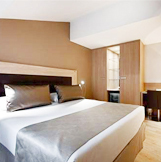 In the morning we will do an excursion to the surroundings of Avila including a visit to the town of Alba de Tormes and the city of Salamanca. In Alba de Tormes is where Saint Theresa died in 1582 and where she is buried. In the museum of the Carmelite Convent of the Annunciation we will be able to see the incorrupt heart and left arm of the Saint. 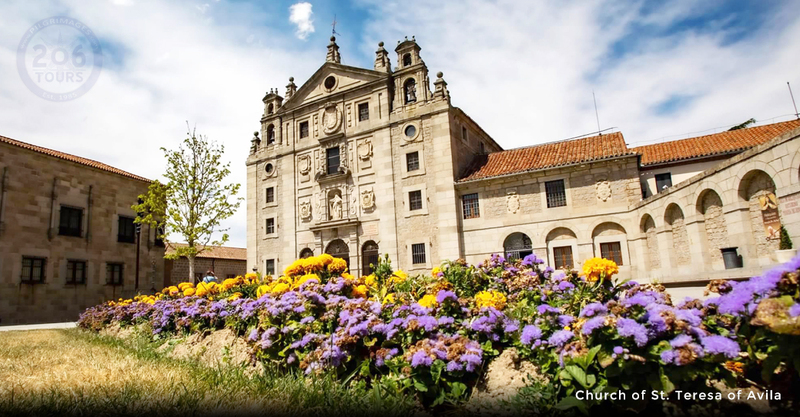 It was in Salamanca where Saint John of the Cross studied Theology and was ordained priest and where Santa Teresa founded the Carmelite Convent in 1570. For four centuries Salamanca was the seat of one of the most prestigious universities in the world and, despite losing this reputation in the XVII Century, it has kept the unmistakable atmosphere of a seat of learning. It is a small place, and it is given a gorgeous harmony by the golden sandstone from which almost the entire city seems to be constructed. 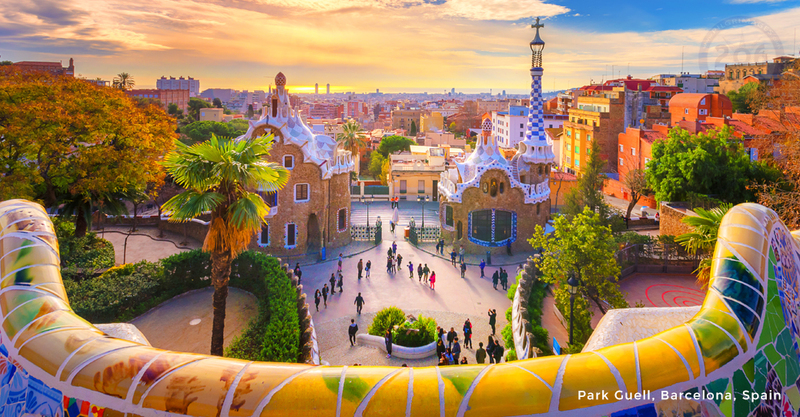 The city’s architectural sights seem endless: two cathedrals, one Gothic, the other Romanesque, vie for attention with Renaissance palaces and gems of Plateresque decoration. 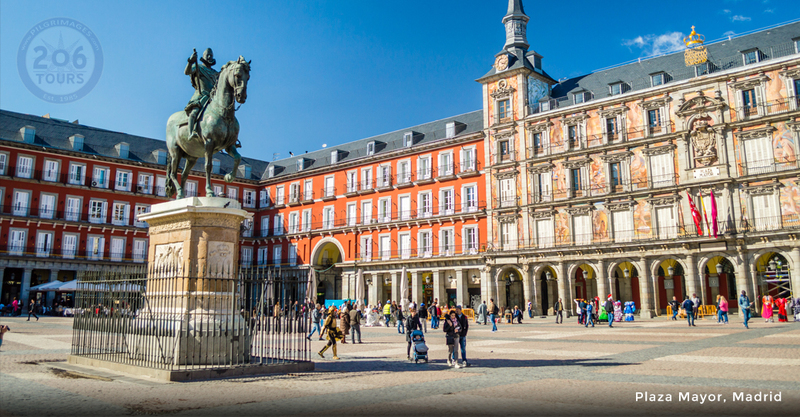 The Plaza Mayor is the finest in Spain; and the surviving university buildings are tremendous throughout, all of them distinguished by the same warm stone. 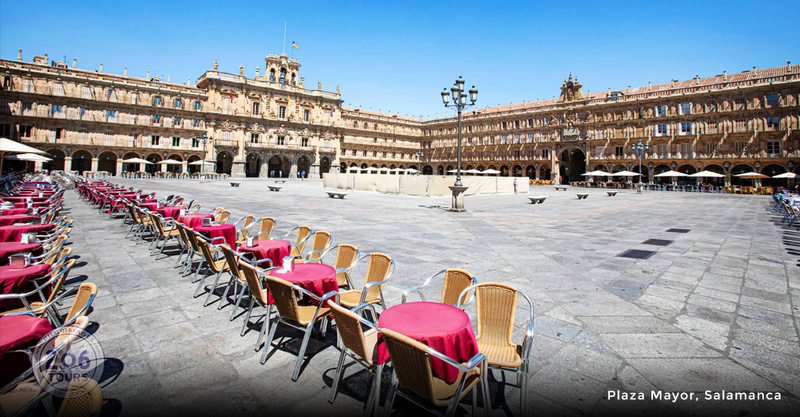 Today we will visit this impressive and beautiful city: The grand Plaza Mayor is the hub of Salmantine life, the vast Baroque church of La Clerecía, the Casa de las Conchas (House of Shells), named after the rows of carved scallop shells symbol of the pilgrimage to Santiago which decorate its façade, the University, the cathedrals, the Roman Bridge, San Marcos and San Martin churches, etc. Dinner and overnight in Avila. Breakfast in the hotel, and then we will depart towards the South of Spain. On or way to Baeza , we will make stop in Malagon where we will find the Carmelite Convent founded by Santa Teresa in April 1568. Continue onto Baeza for dinner and overnight . Breakfast in the hotel. 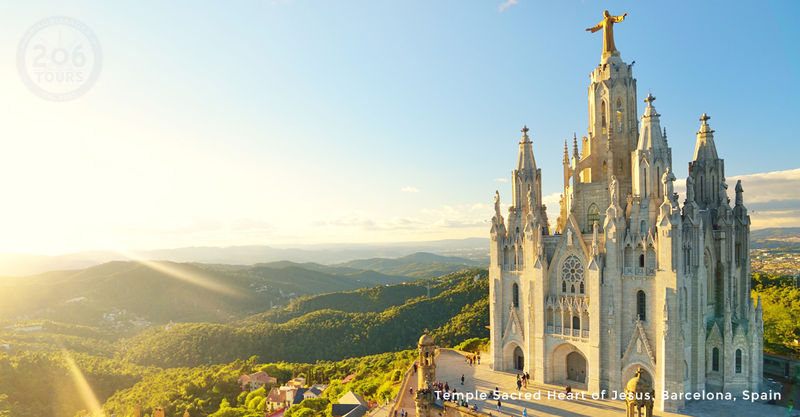 We will spend the day visiting different places related to both Saints. In Baeza Saint John of the Cross worked like a teacher in its famous university and in Ubeda he died in 1591. Both cities, designated World Heritage by Unesco, preserve magnificent buildings and monuments in their medieval and renaissance quarters: Incarnation Convent, Jabalquinto Palace, San Pablo Church, Cathedral, Salvador Church, Santa Maria Church, etc. 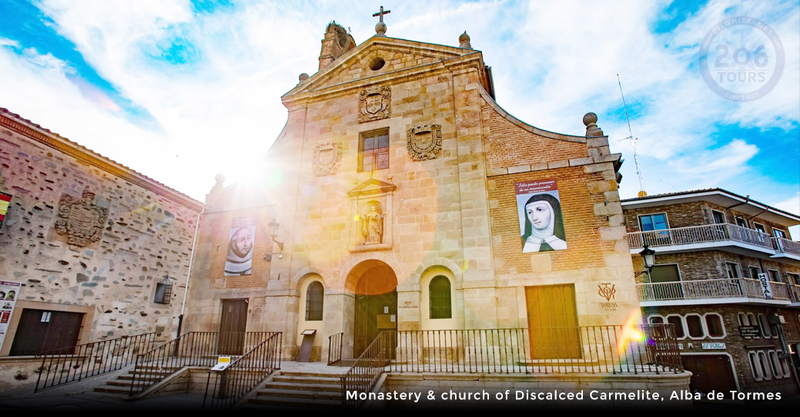 In Beas de Segura we will find the first convent founded by Saint Theresa in Andalucia (South of Spain) that holds many relics of both doctors of the Church. In Villanueva del Arzobispo we will visit the Sanctuary of La Fuensanta where Saint John of the Cross lived after running away from Toledo’s jail, helped by Santa Teresa. Return to Baeza for dinner and overnight. Breakfast in the hotel, and depart towards Granada. Saint John of the Cross was Prior in Granada for many years and we will follow his steps in the city. In the afternoon we will visit one of the most beautiful palaces in the World: The Alhambra Palaces. The meaning of the word Alhambra is “the red fort” and became from its reddish walls. The Alhambra was a palace, a citadel, fortress, and the home of the Nasrid sultans, high government officials, servants of the court and elite soldiers (from the 13th to the 14th century). Today, the monument is divided into four main areas: the Palaces, the military zone or Alcazaba, the city or Medina and the agricultural estate of the Generalife. Woods, gardens and orchards surround all of these areas. 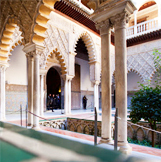 Other notable buildings belonging to a different time period are also included, such as the Renaissance style Palace of Charles V, which houses the Alhambra Museum (most of the items are from the site of the monument) and the Fine Art Museum. In the evening we will enjoy a beautiful and magnificent view of the Alhambra from the San Nicholas view point. Dinner and overnight in Granada. Following an early breakfast, we will continue with the visit to the downtown of Granada where will we find the Cathedral and its Royal Chapel where the Catholics Monarchs (Isabella and Ferdinand) are buried. In the afternoon we will depart towards the city of Seville. Seville has important monuments and an illustrious history, but what it’s essentially famous for its own living self, the greatest city of the Spanish South, of Carmen, Don Juan and Figaro, and the archetype of Andalucian promise. This reputation for gaiety and brilliance, for theatrically and intensity of life, does seem deserved. The city is bisected by the Río Guadalquivir. The old city takes up the east bank and at its heart stand three great monuments: the Giralda Tower, the minaret of the old mosque; the Cathedral, built in the XV Century in Gothic style; and the Alcázar, the Moorish palaces. 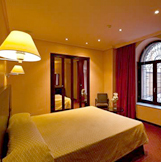 Also we will find the Barrio de Santa Cruz, the medieval Jewish quarter and now the heart of tourist life. 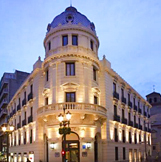 Diner and overnight in Seville. Breakfast in the hotel. 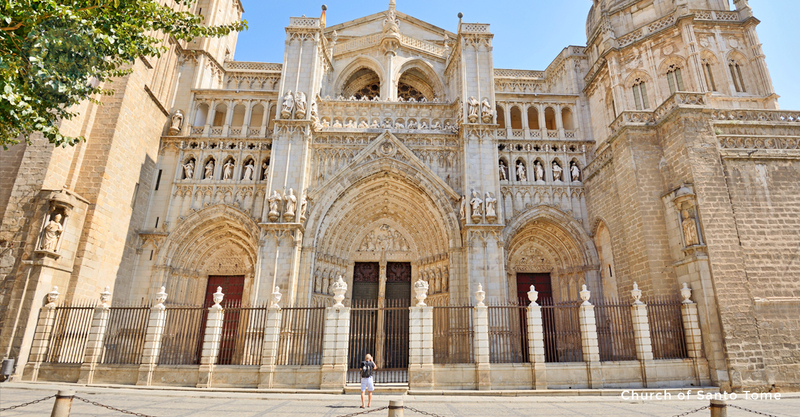 Today we will enjoy a half day tour of Seville, the capital of Andalucia, and the site of Cathedral of Saint Mary, the largest cathedral in Spain and the third largest in Christendom. It is here where Santa Teresa established her 11th foundation in 1575 and it is in the Carmelite Convent of Saint Joseph where the original, autographed copy of Saint Teresa’s Interior Castle is kept. Dinner and overnight in Seville. Following breakfast, we will visit the Imperial City of Toledo where Saint John of the Cross was in prison by the Inquisition. Toledo sits on a rocky mound isolated on three sides by a looping gorge of the Río Tajo. Every available inch of this outcrop has been built upon: churches, synagogues, mosques and houses are heaped upon one another in a haphazard spiral which the cobbled lanes infiltrate as best they can. 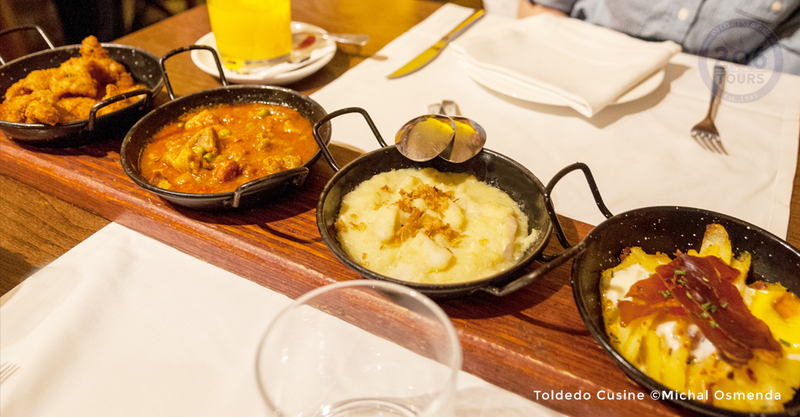 Toledo is known as the City of the Three Religions or Cultures, because for many centuries the Christians, the Moors and the Jews lived together in relative equality and peace. The city, surrounded by walls, hides great treasures: its awesome Cathedral, a robust Gothic construction which took over 250 years (1227 – 1493) to complete; the church of Santo Tomé, where the Greco’s masterpiece is located: The Burial of Mr. Orgaz; the Tránsito Synagogue, actually it holds the Museo Sefardita; Santa María La Blanca Synagogue, the superb church of San Juan de los Reyes, which exterior bizarrely festooned with the chains worn by the Christians prisoners from Granada released on the reconquest of the city; the different doors that keep the city safe: Puerta de Bisagras, Puerta del Cambrón, Puerta del Sol, etc. Continue onto Madrid for dinner and overnight. After breakfast, and with memories that will last a lifetime, we will board our bus that will bring us to the airport for our return flight home. Jubilee Year In Alba De Tormes & Avila! How to Gain a Plenary Indulgence in the Jubilee Year of St. Teresa of Avila: The Apostolic Penitentiary Decree announcing this Teresian Jubilee Year explains that only truly repentant faithful can gain the Plenary Indulgence, provided they meet the customary conditions for all Jubilees: Sacramental Confession, Eucharistic Communion and Prayer for the intentions of the Roman Pontiff. The faithful who fulfill these conditions will be able to profit from this Plenary Indulgence by attending the Jubilee celebrations, pilgrimage to the Jubilee temples or by praying in a very special way in them: according to the Teresian mode of prayer. On November 28th, 1568, in a little town of Duruelo in Spain, St. John the Cross and two companions founded the first house of Discalced Carmelite Friars. The word “Discalced” is better referred to as meaning “Renewed”. St. John of the Cross and St. Teresa of Avila have lft us the spirit of continual striving for renewal as the core feature of life and vocation.